In business competition as a newly established marketplace company within 2 years, Shopee needs to create a strategy to be able to compete with its competitors and can build awareness in the minds of its users, need good communication and also differentiate between Shopee with its users, in this case Shopee choose to do activities cyberbranding. This research aims to know the activities of Cyberbranding by Shopee Indonesia in building brand awareness through the delivery of information, creating interactivity, and making a difference. The research method used is descriptive method. To collect the data, researchers conducted in-depth interviews, observations, and document studies. The results of this research are explain how Shopee's activities in providing information, Shopee convey information one of them through social media, various information is quite well delivered Shopee and adjusted to the needs of current Shopee users. In building interactivity, Shopee still uses social media as a direct communication medium between Shopee and its users, the various quiz contents of Shopee are able to build Shopee engagement with users, and in making a difference Shopee makes a free Postage program as a Shopee flagship program to attract users. Advice given by researchers in building brand awarenss is better if Shopee optimize the use of SEO (Search Engine Organization) in order to improve the position Shopee in search engines. ANGGRAINI, Chindy Ayu; PERBAWASARI, Susie; BUDIANA, Heru Ryanto. CYBERBRANDING SEBAGAI UPAYA MEMBANGUN BRAND AWARENESS SHOPEE INDONESIA. 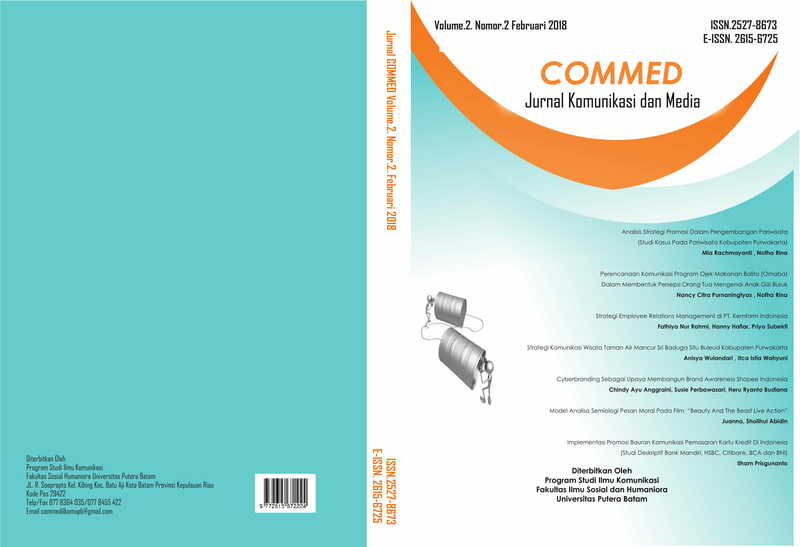 COMMED: Jurnal Komunikasi dan Media, [S.l. ], v. 2, n. 2, p. 72-86, apr. 2018. ISSN 2615-6725. Available at: <http://ejournal.upbatam.ac.id/index.php/commed/article/view/471>. Date accessed: 23 apr. 2019.